Written by The Motor City Madman - Great boxing terminal program! It's really fun to see how these programs have progressed over time. This version is Isepic'd and modified for the Ewok BBS. Still good to have it for completeness of the collection. 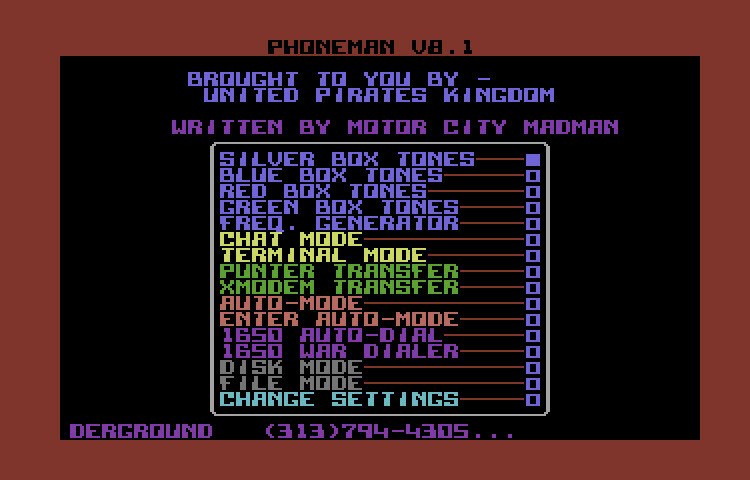 Phone Man v6.3 - Yet another version of this popular terminal program for the Commodore 64. 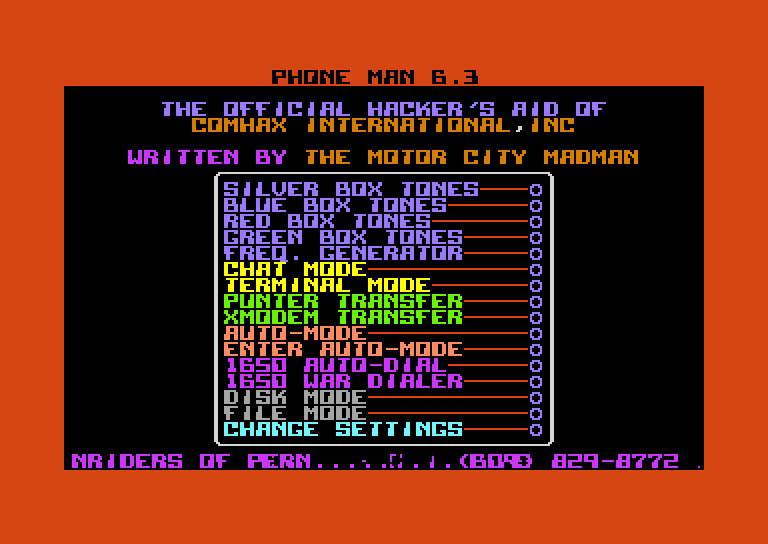 Written by The Motor City Madman - Great boxing terminal program! Another release of the official hackers aid by The Motor City Madman! Written by the Motor City Madman. It appears that in this version you can manually set the baud to 2400. Other than that, it looks a lot like previous versions. Older version but looks a lot like 8.0. Same intro screen and all. 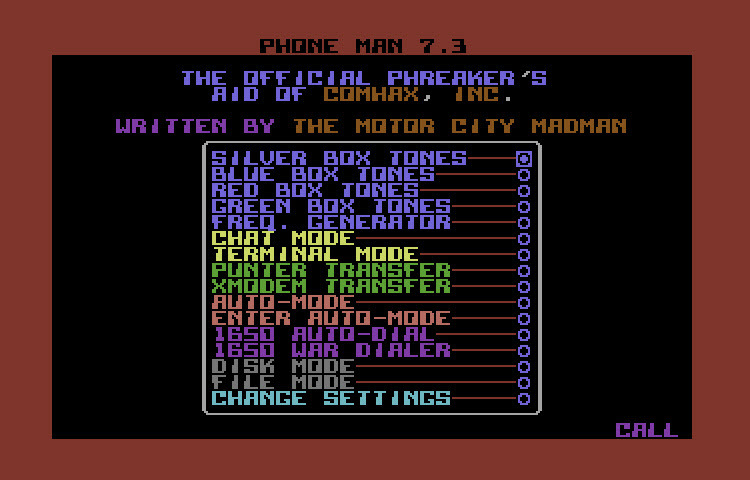 The I.I.R.G's Phreaker's Aid by Comhax, Inc.
Comhax, Inc. 1986 - By the Motor City Madman. Title screen by Bill The Cat. I really love the intro screen. Nice full fledged terminal with added features like box tones and freq. generator. 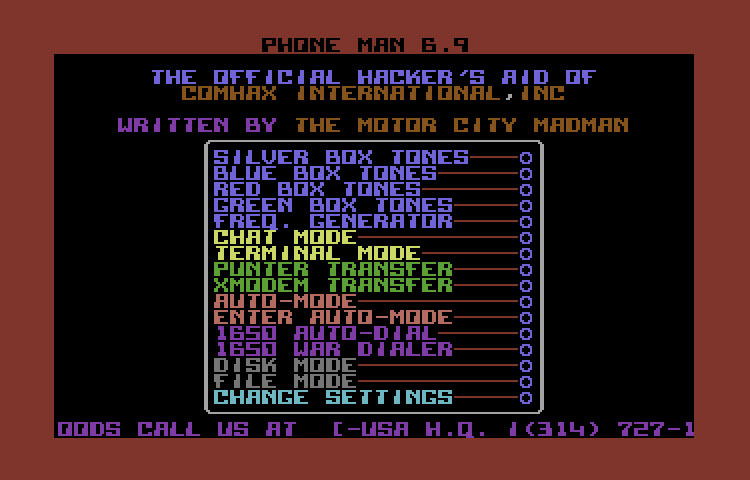 Comhax, Inc. 1986 - By the Motor City Madman. Single file version. The official phreaker's aid of the I.I.R.G. Brought to you by Mercenary. Love this program and all it's previous versions. "Comrade Mode" for the win!